The organic sector in Chile only started a few years ago and is still small. However, comparative advantages for off-season supply in the northern markets and experience with exports of fresh produce provide great potential for strong growth of the organic sector. The main limiting factors include institutional weakness and the lack of "know-how" in organic production. The first few farms started to produce organically in a commercial way in the late 1980s. As no national certification entities existed at that time, national organic guidelines had not yet been formulated and not much information about organic farming methods was available, while extension services for organic farming were absent. Therefore, these first pioneers, who started thanks to their own conviction to produce in a "green way", initially were farming on a "trial-and-error" basis. No Government action or support to organic agriculture existed. The fact that organic agricultural production and the marketing of the produce faced many difficulties in the first years is illustrated by Carlos Meza, Director of Huerto San Nicolás, an organic producer and exporter (SAG, 2000). Starting to produce organically in 1989, they first had to adopt organic farming practices (including use of organic fertilizers and bio-pesticides) to the local climate and soil conditions. Initially, Mr Meza produced vegetables, but was faced with a major problem in marketing the products. No price premium was paid for the products, which were, due to the lack of organic certification, sold as conventional products. After experiencing limited domestic demand for organic products, the company decided to produce for export only, and changed its production to berries. Again, organic farming practices had to be adjusted to local conditions, which was not so difficult. However, the low profitability of organic berry exports led the Director of the company to decide to change again, this time to the production of organic apples. Despite some initial difficulties to produce apples organically (difficult to fight disease organically), in 1998 the company exported its first fully organic certified apples to the United States. Now a successful organic apple exporter, it took the company almost ten years and three different core products before such success could be realized. This is an example that applies to many organic producers in Chile. Organic agriculture in Chile has only in the last few years of the 1990s gained some momentum. It is estimated that in 1998 about 200 organic farms were producing on 2 700 organic certified ha. Compared with the total area under agricultural production in Chile (more than 15 million ha), the area under organic agricultural production accounts for less than 0.02 percent of the total agricultural area (FNOA, 2000). In 2000, the total area under organic production was estimated at 3 300 ha. Of this organic area, over 82 percent was under organic production for less than 5 years (Hernández, 2000). In other words, in 1995, the area under organic production was estimated at less than 600 ha. More information on organic production is provided in section 4. With the growth of the sector, the involvement of institutions, such as the Government (in formulating organic guidelines and indirect support to organic exports), organic certifiers and farmers' organizations also developed in parallel. It is expected that the sector, currently still relatively small, will continue to increase its size and improve its performance. The first organization in Chile dealing with organic agriculture was MACH: Movimiento Agroecológico Chileno. With the growth of the organic sector in the late 1990s, there was a need for an umbrella organization for the organic sector, which resulted in 1999 in the establishment of AAOCH -Agrupación de Agricultura Orgánica de Chile A.G. (or Organic Agriculture Association of Chile). This organization is comprised of institutions, businesses and individuals active in organic agriculture and aims at promoting organic agriculture. AAOCH represents producer interests in international exhibitions and fairs, and works in the development of agro-ecological projects, commercialization, promotion, certification and research, among others. Contact details can be found in the Annex. The Servicio Agrícola y Ganadero (SAG) of the Ministry of Agriculture (MOA) is the leading Government agency for the organic sector. It has established a National Certification System, to verify compliance with official regulations governing organic production (see section 3). Another important agency is the Ministry of Foreign Affairs through its export promotion agency ProChile. The objective of ProChile is to promote Chilean exports, especially non-traditional (i.e. "new") exports. Since 1995, when an Agricultural Export Promotion Fund was established by the Ministry of Foreign Affairs, promotion of organic products abroad has been included in ProChiles programme. ProChile sponsors activities, such as workshops and seminars, and represents the organic sector in international trade fairs and exhibition (e.g. BioFach in Nuremberg). In early 2001, four organic certifiers were active in Chile: two national and two international. The two national certifiers are CCO (Certificadora Chile Orgánico) and PROA (Corporación de Promoción Orgánica Agropecuaria). Both were established in the early 1990s, and during most of the past decade, these were the only two certification bodies in the country. A few years ago, two foreign certifiers established representation in Chile: the German certifier BCS and the Swiss certifier IMO. Some of the persons interviewed observed the tendency among Chilean organic producers to switch away from the Chilean certifiers towards the foreign ones mentioned above because VCS and IMO certification implies easier access to the EC market. Since both VCS and IMO have equivalent certification and inspection systems recognized by the EC, this is a major advantage over the national certifiers who do not enjoy such a status. For exports to the United States, by far the most import destination for organic fruits and vegetable exports from Chile with 70 percent (see section 5), there is no difference between national or international certifiers. Another organization active in the organic sector is FNOA: Feria Nacional de Agricultura Orgánica (or National Organic Agriculture Fair). In November 2000, FNOA organized, among other activities, a one-day seminar on "Organic agriculture, health for the people and the environment" (FNAO, 2000). The SAG of the Ministry of Agriculture has formulated regulations for organic production in Chile. Moreover, it has established a National Certification System to verify compliance with those rules. The two official regulations that apply to organic farming in Chile are: "Chilean Norm NCH2439 Production, processing, commercialization and labelling of organically produced foodstuffs" and "Chilean Norm NCH2079: General criteria for certifying organic production, processing, transport and storage systems". The regulations, in place since May 1999, give definitions of basic production, processing and labelling standards, as well as control and inspection requirements, among others. The Chilean organic regulations are based on existing organic rules in the EC and the United States, and the Chileans claim these rules to be equivalent to EC Regulation N0. 2092/91 and EN 45011 or ISO 65 (SAG, 2000b). However, the organic norms are guidelines rather than legislation. The lack of strong legislation was mentioned by some interviewed market sources as a major obstacle to growth for the Chilean organic sector. Another source confirms these findings and gives as one of the main weaknesses of the Chilean organic sector "...the lack of an institutional system of strict control and supervision..." (Chile Agrícola, 1999). The article was published about five months after the establishment of the domestic organic rules, and should therefore be seen as a reliable source. Chile has, thanks to its north-south length of more than 4 000 kilometres, a wide range of different climates in its territory, which enables the production of many different types of agricultural products. Together with its endowment of a natural fertile soil and clean water from the Andes mountains, many parts of Chile are particularly well suited for organic agricultural production. Moreover, the isolated position between natural barriers (Andes in the east, the Atacama desert in the north, and the Pacific Ocean in the west) enables the country to stay free from many plagues and diseases, still a significant problem in organic farming. The country is administratively divided into 13 provinces (called "Regions"): from Region I in the extreme north to Region XII in the south, while the capital Santiago, is a separate region (Región Metropolitana). Organic agriculture takes place between Regions IV and X, or from La Serena to Puerto Montt, although it is mostly concentrated in Regions VI, VII and X (based on area under organic production). This is due to the fact that in those Regions dairy farming is a common practice, and the organic dairy farms generally cover a larger area than the organic horticultural farms in the northern Regions. Due to the fact that organic farming began only a few years ago and to its limited size, little information on production nor trends are available (Hernández, 2000). In this section data obtained from ProChile (the Chilean Trade Commission, an agency within the Ministry of Foreign Affairs) is used, which is mostly based on information provided by organic certification bodies. The total area under organic production was estimated at the end of the 1999/00 season at 3 300 ha, an increase of 23 percent compared with the area under organic production two seasons before. Table 1 shows the spectacular increase in the area under organic wine production, which increased from 44 ha in 1997/98 to almost 440 in 1999/00. Source: Hernández, 2000 (based on PROA figures). As shown in Table 1, the area under organic fruit production in the 1999/00 season was estimated at 683 ha, up 23 percent from the 1997/98 season. The area under organic vegetable production was 140 ha, and its growth rate of six percent in two years was much lower compared to organic fruits. Table 2 shows the area under organic fruits and vegetables by product. In the 1999/00 season the biggest single organic fresh fruit was apple, with an estimated area of 144 ha. However, compared to the total area under apple production in Chile (40 000 ha, FAS 2000), this represents only 0.4 percent of total apple production. Other major organic fruits include raspberries (122 ha), avocado (100 ha) and kiwi (81 ha). Among vegetables, asparagus (96 ha) are by far the biggest single crop, accounting for almost 70 percent of all area under organic vegetable production. A recent FAS report states that, according to certain market sources, there is a large potential for expansion of organic apples (FAS, 2000). The report noted that organic apple yields were significantly lower than for conventional apples (about two-thirds lower, i.e. an estimated 8 tonnes per hectare for organic versus 25 tonnes per hectare in a conventional orchard), but fails to explain the main reasons for this huge difference. The observed difference between organic vs. conventional apple yields is even bigger than the already huge difference reported in other countries. (For comparison: organic apple yields in the Netherlands are reported to be about half of conventional apple yields). Disease pressure and difficulties in fighting diseases in an organic way seem the most logical explanations for the lower yields. Yields of organic cherry production are estimated at 2.5 tonnes, compared with 4.4 tonnes for conventional cherry production (FAS, 2000). Most organic producers are small and medium size farmers, who have developed their own methods of organic farming. More than 80 percent of organic farms are smaller than ten hectares (Hernández, 2000). The major part of enterprises responsible for packing, processing and commercialization of the products (mostly exports) are those which are conventional processors and exporters who have started with a separate product-line (or -treatment) alongside their conventional activities. Specialized organic traders and processors, seen in many European countries and in the United States, are not common in Chile. Despite its favourable natural, climatological and physical conditions, combined with the generally low pest pressure, organic farming in Chile is faced with a range of production constraints. As a newly evolving sector, organic based best practices are not yet common in the country, forcing many new organic farmers to "re-invent the wheel", many times on a trial-and-error basis. Extension services are virtually absent, and only since the establishment of the AAOCH (Agrupación de Agricultura Orgánica de Chile) in 1999, some coordination and exchange of experiences has taken place among organic farmers. Another point mentioned during some of the interviews with market sources is the reliability of organic fertilizers and bio-pesticides. Whereas neighbouring Argentine farmers express their concern about the limited availability of such organic inputs in their country, the problem in Chile seems not to be the availability but the content of such products. Without clear legislation on which products are allowed and which are not, there is room for a grey area of "nature friendly" inputs called "organic", but not necessarily complying with all of the organic requirements. Anecdotal information gives cases in which some products sold as "organic fertilizers" nevertheless contain ingredients that are forbidden in organic inputs. Farmers who do not know that some of the contents of these products are forbidden in organic agriculture might lose their organic certification after having applied such products, thinking they were "organic". No government support or incentive for organic production exist in Chile (FAS, 2000). Government sources have indicated that for organic production in general, an estimated 60 percent is exported and 40 percent is for domestic consumption (FAS, 2000). However, for certain products, e.g. apples, the report states that (according to some producers) organic apples are produced for export only. Although no precise information on the domestic organic market is available, it is safe to say that its size is rather insignificant. The Chilean market for food items in general, and for fruits and vegetables in particular, is dominated by large super/hypermarket chains, which try to attract consumers through aggressive price discounts. Whereas in Argentina the market for organic fruits and vegetables has created some consumer awareness in the urban areas during the second half of the 1990s, in Chile such awareness is still absent. Surprisingly, Jumbo, a major Chilean chain of super/and hypermarkets, introduced organics into their Argentine outlets in 1992, and by doing so, created consumer awareness for organic products. In their home market of Chile these efforts have not yet been seen on a large scale. Some supermarkets sell on an irregular basis selected organic fruits or vegetables. However, whereas producto orgánico is the official term in Spanish, most of the times the products are sold under the name producto ecológico, a term which sounds greener to consumers not familiar with the organic concept. Some organic products are sold outside the conventional supermarket retail chains, but quantities involved are still small. Fresh organic fruits and vegetables in particular are sold through direct farm sales or home delivery. The absence of a national logo for organics, among other reasons, is expected to frustrate efforts to establish a domestic organic market. Therefore, prospects for development of the domestic market are not particularly rosy for the short term. Most organic producers in Chile will continue to focus on the export market. Since no different nomenclature for organic products is used by Chilean customs, no official data exist on the quantities of organic products exported. However, information on organic exports obtained by ProChile, gives rather precise estimates of volume and value of exported organic products (see Table 3 and Graph 1). 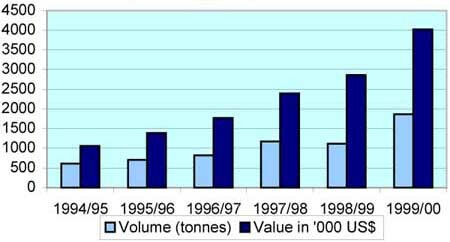 Table 3 and Graph 1 show that over the last six seasons for which data is available (1994/95-1999/00), an increase in exported volume of all organic products was observed from just over 600 tonnes in 1994/95 to almost 1 900 tonnes in 1999/00. The value of these exports expanded even faster, from US$1 million to US$4 million in the same period. Of the US$4 million total value figure, about three-fourths (US$3.1 million) consist of fresh organic horticultural products: fresh organic fruits (US$1.5 million) and fresh organic vegetables (US$1.6 million). The remaining one-fourth (almost US$1 million) consists of processed products, including frozen raspberries, frozen asparagus and other products, such as honey. Graph 2 gives the destination of organic fruit and vegetable exports (based on volumes). The graph shows the importance of the United States market, accounting for almost 70 percent of all fresh organic horticultural exports from Chile. The second most important destination is Europe, while "other" countries (i.e. Japan and Canada) accounted for only 7 percent of organic fruit and vegetable exports in the 1999/00 season. Detailed information on organic horticultural exports by product is available only for the 1999/00 season (see Table 4). Table 4 shows that by far the biggest single item exported is asparagus (with a value of more than US$1 million), followed by raspberry and kiwi. The relatively limited value of exports of organic apples, compared to the area under organic apple production (Table 2), gives support to Government information (see section 5.1), which reports that a significant share of organic produce is consumed domestically, contradicting information provided by producers (FAS, 2000). Another possibility is that organic apples are exported, or recorded as exported, as conventional. An assessment of Chilean organic products with high potential in its most important market (United States, Table 4), concluded that cherries are the only fresh horticultural product, besides frozen raspberries, wine, honey and some other processed products, to have good prospects (Hernández, 2000). Export constraints are not among the greatest limiting factors for growth of the Chilean organic sector. The country has a world-wide image of being a significant exporter of (conventional) agricultural fresh (e.g. apples and grapes) and processed products (e.g. wine). This image, combined with the available knowledge and infrastructure for exports, as well as the advantage of the opposite production season compared with the major consumption markets in the northern hemisphere, enable relatively easy exports of organic products. The limitations to growth of the sector seem more to be at the production level than on the export level. However, two important points should be highlighted. First, the current accreditation, certification and control system has not been recognized by the EC as being equivalent to their system. As a consequence, Chile is not included on the EC-list of third countries. Therefore, Chile faces serious competition in exporting to the EC. 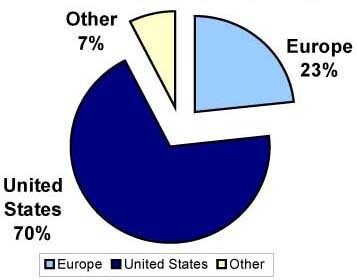 Second, 70 percent of organic horticultural exports from Chile go to the United States, making Chile highly dependent on that market (see above). An economic slowdown in the United States or a deterioration of the exchange rate between the US dollar and the Chilean peso is expected to strongly influence the development of the Chilean organic sector. No direct support to organic exports is provided by the Chilean Government. However, indirect support exists through ProChile, which promotes Chilean exports, especially of non-traditional products, through support to companies to position themselves in foreign markets. In 1995, the Agricultural Export Fund was created by the Ministry of Agriculture. Its activities include assessments of (potential) export markets, contributions to seminars and support to companies in international trade fairs (such as BioFach in Germany), among others. This short case study has shown that the Chilean organic sector is still a relatively small and young sector. However, thanks to the adaptation of domestic guidelines for organic production and requirements for control in 1999, combined with the establishment of an umbrella organization co-ordinating efforts in the organic sector in the same year, the Chilean organic sector has gained momentum and shown significant percentual growth during the last few years, both in area under organic production as volume and value of exports. Most organic products are exported. For organic fruits and vegetables, the United States market accounts for about 70 percent of organic exports, followed by the EC market with 23 percent. The following section analyzes the Chilean organic horticultural sector, using SWOT-analysis: Strengths, Weakness, Opportunities and Threats. It provides the sectors strengths and successes so far, but also lists factors that might limit further growth. It identifies the main opportunities for organic horticultural exports for the coming years. Finally, it discusses some threats that might negatively influence the continuation of the growth of the sector observed during the late 1990s. One of the strengths of Chiles organic sector is its opposite growing season compared to the northern consumption markets, enabling supply of fresh and perishable products when production in the northern hemisphere is absent. Additionally, the different climates in its long north-south territory combined with the endowment of naturally fertile soil and clean water from the Andes mountains, enables Chile to produce many different types of organic agricultural products. Moreover, organic agricultural production in Chile is generally faced with low pest pressure and few diseases, thanks to the geographical position of the country. Finally, the experience that Chile has as an agricultural exporter and its knowledge and infrastructure for exports, have given the country an image as agricultural exporter. The organic sector could use this existing image to expand exports to foreign markets. Sea transport costs are also advantageous as organic exports can benefit from volume discounts negotiated by conventional horticultural exporters. As the organic sector in Chile is still relatively young, there are a number of factors that negatively influence its further growth. Due to the lack of experience, many organic farmers do not have the knowledge on the "best practices", which should be used for Chilean soil and climatological conditions. Extension services for organic farmers are absent and information for producers is scarcely available. Moreover, no special financial arrangements for farmers exist to assist them in overcoming additional costs for converting to new farming practices. Some of the interviewed persons mentioned the general lack of political willingness to provide incentives for organic farming. Also, despite the formulation of domestic guidelines for organic production, no binding regulations exist. The fact of not being included in the EC list of third countries is a relative disadvantage. The organic sector in Chile has various opportunities in the forthcoming years to become a significant player in international organic markets. When some of the above mentioned weaknesses are overcome, the potential of growth, thanks to the many strengths of the sector, is enormous. With the expected continuation of fast growth of demand in northern markets, due to an increasing interest in safety aspects of food products, Chile is poised to provide fresh off-season organic products, including many fruits and vegetables. One possible threat for the near term future is competition from producers with similar comparative advantages (e.g. supply of fresh off-season products) for the northern markets. Another, though perhaps less significant factor, is the increasing supply of "green" and "healthy" products, but not necessarily fully certified organic products. This is not specific to Chile, but for the world-wide organic sector. Finally, costs of organic production are generally higher than conventional production costs, due to lower yields and costs for certification and control. With the increase in importance of supermarkets as a sales outlet for organic products, lower retail prices might depress farmgate prices, and consequently negatively influence producers benefits. This case study has shown that although the organic sector in Chile just began a few years ago, great potential exists for further enhancement of the sector, especially through exports. Chiles image as an agricultural exporter and comparative advantages for off-season supply in the northern market provide strong forces for continuing growth. However, a number of factors currently prevent the Chilean organic sector from taking full advantage of those strengths. Before domestic organic production and exports can contribute a significant percentage to Chiles agricultural sector, the main limiting factors at the production level and the institutional weaknesses need to be overcome. AAOCH-Agrupación de Agricultura Orgánica de Chile A.G.
Huertos Orgánicos de Chile S.A.